The garden strawberry (or simply strawberry; Fragaria × ananassa)  is a widely grown hybrid species of the genus Fragaria, collectively known as the strawberries. It is cultivated worldwide for its fruit. The fruit is widely appreciated for its characteristic aroma, bright red color, juicy texture, and sweetness. It is consumed in large quantities, either fresh or in such prepared foods as preserves, juice, pies, ice creams, milkshakes, and chocolates. Artificial strawberry flavorings and aromas are also widely used in many products like lip gloss, candy, hand sanitizers, perfume, and many others. The very first garden strawberry was grown in Brittany, France, during the late 18th century. Prior to this, wild strawberries and cultivated selections from wild strawberry species were the common source of the fruit. The strawberry fruit was mentioned in ancient Roman literature in reference to its medicinal use. The French began taking the strawberry from the forest to their gardens for harvest in the 14th century. Charles V, France's king from 1364 to 1380, had 1,200 strawberry plants in his royal garden. 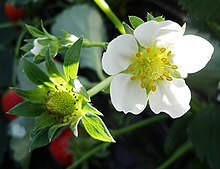 In the early 15th century western European monks were using the wild strawberry in their illuminated manuscripts. The strawberry is found in Italian, Flemish, and German art, and in English miniatures. [ citation needed] The entire strawberry plant was used to treat depressive illnesses. The combination of strawberries and cream was created by Thomas Wolsey in the court of King Henry VIII. Instructions for growing and harvesting strawberries showed up in writing in 1578. By the end of the 16th century three European species had been cited: F. vesca, F. moschata, and F. viridis. The garden strawberry was transplanted from the forests and then the plants would be propagated asexually by cutting off the runners. Strawberries may also be propagated by seed, though this is primarily a hobby activity, and is not widely practiced commercially. A few seed-propagated cultivars have been developed for home use, and research into growing from seed commercially is ongoing. Seeds ( achenes) are acquired either via commercial seed suppliers, or by collecting and saving them from the fruit. The Kashubian strawberry (Truskawka kaszubska or Kaszëbskô malëna)  is the first Polish fruit to be given commercial protection under EU law. They are produced in Kartuzy, Kościerzyna and Bytów counties and in the municipalities of Przywidz, Wejherowo, Luzino, Szemud, Linia, Łęczyce and Cewice in Kashubia. Only the following varieties may be sold as kaszëbskô malëna: Senga Sengana, Elsanta, Honeoye that have been graded as Extra or Class I. The harvesting and cleaning process has not changed substantially over time. The delicate strawberries are still harvested by hand. Grading and packing often occurs in the field, rather than in a processing facility. In large operations, strawberries are cleaned by means of water streams and shaking conveyor belts. Around 200 species of pests are known to attack strawberries both directly and indirectly. These pests include slugs, moths, fruit flies, chafers, strawberry root weevils, strawberry thrips, strawberry sap beetles, strawberry crown moth, mites, aphids, and others. The caterpillars of a number of species of Lepidoptera feed on strawberry plants. For example, the Ghost moth is known to be a pest of the strawberry plant. Propagation is by runners, which can be pegged down to encourage them to take root,  or cut off and placed in a new location. Established plants should be replaced every three years, or sooner if there are signs of disease. In addition to being consumed fresh, strawberries can be frozen, made into preserves,  as well as dried and used in prepared foods, such as cereal bars. Strawberries and strawberry flavorings are a popular addition to dairy products, such as strawberry-flavored milk, strawberry ice cream, strawberry milkshakes, strawberry smoothies and strawberry yogurts. In the United Kingdom, "strawberries and cream" is a popular dessert consumed at the Wimbledon tennis tournament. Strawberries and cream is also a staple snack in Mexico, rarely unavailable at ice cream parlors. In Sweden, strawberries are a traditional dessert served on St John's Day, also known as Midsummer's Eve. Depending on area, strawberry pie, strawberry rhubarb pie, or strawberry shortcake are also popular. In Greece, strawberries are usually sprinkled with sugar and then dipped in Metaxa, a famous brandy, and served as a dessert. In Italy, strawberries have been used for various desserts and as a popular flavoring for gelato (gelato alla fragola). In the Philippines, strawberries are also popular, in which it is used for making the syrup in taho. Modern strawberries have complex octaploid genetics (8 sets of chromosomes),  a trait favoring DNA extractions. Strawberries have been sequenced to display 7,096 genes. Strawberries suffer from severe inbreeding depression, and most cultivars are highly heterozygous. In many entry level Biology classes, strawberries are used to demonstrate the extraction of DNA due to their octoploid structure. Some people experience an anaphylactoid reaction to eating strawberries. The most common form of this reaction is oral allergy syndrome, but symptoms may also mimic hay fever or include dermatitis or hives, and, in severe cases, may cause breathing problems. Proteomic studies indicate that the allergen may be tied to a protein for the red anthocyanin biosynthesis expressed in strawberry ripening, named Fra a1 (Fragaria allergen1). Homologous proteins are found in birch pollen and apple, suggesting that people may develop cross-reactivity to all three species. ^ Manganaris GA, Goulas V, Vicente AR, Terry LA (March 2014). "Berry antioxidants: small fruits providing large benefits". Journal of the Science of Food and Agriculture. 94 (5): 825–33. doi: 10.1002/jsfa.6432. PMID 24122646. ^ Wang SW.; Millner P. (2009). "Effect of Different Cultural Systems on Antioxidant Capacity, Phenolic Content, and Fruit Quality of Strawberries (Fragaria × aranassa Duch.)". Journal of Agricultural and Food Chemistry. 57 (20): 9651–9657. doi: 10.1021/jf9020575. PMID 20560628. ^ Wang SY, Lin HS (November 2003). "Compost as a soil supplement increases the level of antioxidant compounds and oxygen radical absorbance capacity in strawberries". Journal of Agricultural and Food Chemistry. 51 (23): 6844–50. doi: 10.1021/jf030196x. PMID 14582984. ^ a b "10 facts about Florida strawberries that might surprise you". 2016-03-07. Retrieved 2018-06-07. ^ Wilson, D.; Goodall, A.; Reeves, J. (1973). "An improved technique for the germination of strawberry seeds". Euphytica. 22 (2): 362. doi: 10.1007/BF00022647. ^ "Strawberries in winter? Welcome to franken-season". The Independent. Retrieved 2018-06-07. ^ "Strawberry Diseases". Colorado State University. Retrieved March 28, 2018. ^ a b Giampieri F, Alvarez-Suarez JM, Mazzoni L, Romandini S, Bompadre S, Diamanti J, Capocasa F, Mezzetti B, Quiles JL, Ferreiro MS, Tulipani S, Battino M (March 2013). "The potential impact of strawberry on human health". Natural Product Research. 27 (4–5): 448–55. doi: 10.1080/14786419.2012.706294. PMID 22788743. ^ a b c d Giampieri F, Tulipani S, Alvarez-Suarez JM, Quiles JL, Mezzetti B, Battino M (January 2012). "The strawberry: composition, nutritional quality, and impact on human health". Nutrition. 28 (1): 9–19. doi: 10.1016/j.nut.2011.08.009. PMID 22153122. ^ Lipińska L, Klewicka E, Sójka M (September 2014). "The structure, occurrence and biological activity of ellagitannins: a general review". Acta Scientiarum Polonorum. Technologia Alimentaria. 13 (3): 289–99. doi: 10.17306/j.afs.2014.3.7. PMID 24887944. ^ a b Vrhovsek, U.; Guella, G.; Gasperotti, M.; Pojer, E.; Zancato, M.; Mattivi, F. (2012). "Clarifying the Identity of the Main Ellagitannin in the Fruit of the Strawberry, Fragaria vesca and Fragaria ananassa Duch". Journal of Agricultural and Food Chemistry. 60 (10): 2507–2516. doi: 10.1021/jf2052256. PMID 22339338. ^ Khan N, Syed DN, Ahmad N, Mukhtar H (July 2013). "Fisetin: a dietary antioxidant for health promotion". Antioxidants & Redox Signaling. 19 (2): 151–62. doi: 10.1089/ars.2012.4901. PMC 3689181. PMID 23121441. ^ Aaby, K; Skrede, G; Wrolstad, R. E. (2005). "Phenolic composition and antioxidant activities in flesh and achenes of strawberries (Fragaria ananassa)". Journal of Agricultural and Food Chemistry. 53 (10): 4032–40. doi: 10.1021/jf048001o. PMID 15884835. ^ Fossen, Torgils; Rayyan, Saleh; Andersen, Øyvind M (2004). "Dimeric anthocyanins from strawberry (Fragaria ananassa) consisting of pelargonidin 3-glucoside covalently linked to four flavan-3-ols". Phytochemistry. 65 (10): 1421–1428. doi: 10.1016/j.phytochem.2004.05.003. PMID 15231416. ^ Thompson, J. L.; Lopetcharat, K; Drake, M. A. (2007). "Preferences for commercial strawberry drinkable yogurts among African American, Caucasian, and Hispanic consumers in the United States". Journal of Dairy Science. 90 (11): 4974–87. doi: 10.3168/jds.2007-0313. PMID 17954736. ^ Colquhoun TA, et al. (2012). "Framing the perfect strawberry: An exercise in consumer-assisted selection of fruit crops" (PDF). Journal of Berry Research. 2 (1): 45–61. doi: 10.3233/JBR-2011-027. Archived from the original (PDF) on 27 April 2014. ^ a b Schwieterman, M. L.; Colquhoun, T. A.; Jaworski, E. A.; Bartoshuk, L. M.; Gilbert, J. L.; Tieman, D. M.; Odabasi, A. Z.; Moskowitz, H. R.; Folta, K. M.; Klee, H. J.; Sims, C. A.; Whitaker, V. M.; Clark, D. G. (2014). "Strawberry flavor: Diverse chemical compositions, a seasonal influence, and effects on sensory perception". PLoS ONE. 9 (2): e88446. Bibcode: 2014PLoSO...988446S. doi: 10.1371/journal.pone.0088446. PMC 3921181. PMID 24523895. ^ Jouquand, Celine; Chandler, Craig; Plotto, Anne; Goodner, Kevin (2008). "A Sensory and Chemical Analysis of Fresh Strawberries Over Harvest Dates and Seasons Reveals Factors that Affect Eating Quality" (PDF). Amer. Soc. Hort. Sci. 133 (6): 859–867. doi: 10.21273/JASHS.133.6.859. ^ Hirakawa, H; Shirasawa, K; Kosugi, S; Tashiro, K; Nakayama, S; Yamada, M; Kohara, M; Watanabe, A; Kishida, Y; Fujishiro, T; Tsuruoka, H; Minami, C; Sasamoto, S; Kato, M; Nanri, K; Komaki, A; Yanagi, T; Guoxin, Q; Maeda, F; Ishikawa, M; Kuhara, S; Sato, S; Tabata, S; Isobe, S. N. (2014). "Dissection of the octoploid strawberry genome by deep sequencing of the genomes of fragaria species". DNA Research. 21 (2): 169–81. doi: 10.1093/dnares/dst049. PMC 3989489. PMID 24282021. ^ Bombarely, A; Merchante, C; Csukasi, F; Cruz-Rus, E; Caballero, J. L.; Medina-Escobar, N; Blanco-Portales, R; Botella, M. A.; Muñoz-Blanco, J; Sánchez-Sevilla, J. F.; Valpuesta, V (2010). "Generation and analysis of ESTs from strawberry (Fragaria xananassa) fruits and evaluation of their utility in genetic and molecular studies". BMC Genomics. 11: 503. doi: 10.1186/1471-2164-11-503. PMC 2996999. PMID 20849591. ^ Patiwael, J. A.; Vullings, L. G.; De Jong, N. W.; Van Toorenenbergen, A. W.; Gerth Van Wijk, R; De Groot, H (2010). "Occupational allergy in strawberry greenhouse workers". International Archives of Allergy and Immunology. 152 (1): 58–65. doi: 10.1159/000260084. PMID 19940506. ^ a b Muñoz, C; Hoffmann, T; Escobar, N. M.; Ludemann, F; Botella, M. A.; Valpuesta, V; Schwab, W (2010). "The strawberry fruit Fra a allergen functions in flavonoid biosynthesis". Molecular Plant. 3 (1): 113–24. doi: 10.1093/mp/ssp087. PMID 19969523. ^ Hjernø K, Alm R, Canbäck B, Matthiesen R, Trajkovski K, Björk L, Roepstorff P, Emanuelsson C (2006). "Down-regulation of the strawberry Bet v 1-homologous allergen in concert with the flavonoid biosynthesis pathway in colorless strawberry mutant". Proteomics. 6 (5): 1574–87. doi: 10.1002/pmic.200500469. PMID 16447153.